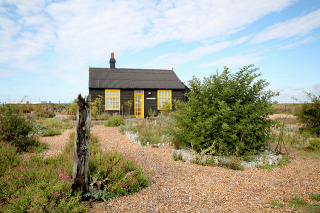 There is an argument to be made that Derek Jarman’s garden at Dungeness is not a piece of Art at all, but regardless of the fact that I have little or no interest in gardening, I believe this would be a fallacious suggestion. For Jarman’s garden at Dungeness clearly follows through in the spirit of other adventures in the visual realm, be that painting, photography, film, sculpture, whatever. All involved with the manipulations of line, shape, texture, form, light, colour… Does this make every gardner an artist? Of course not, for to be an artist first you must perceive yourself to be such. Only artists truly believe themselves to be artists, and artists only. I am sure the same is true of gardeners. As with anything, when thinking about Jarman’s garden at Dungeness we must remember that context is everything. Perched at the end of England, Dungeness is a strange outlaw land of contrasts and tensions. Nuclear power station cheek by jowl with nature reserve; a tourist destination with no tourist attractions; a windswept desert on the edge of a gloomy introspective land. Very much a Marmite kind of place, it is very difficult to explain the magic to anyone who has either never been or who has been and doesn’t ‘get it’. My suspicion is that for those who are bitten by its beauty it is a difficult place to forget. I think I can understand what drew Jarman here. Having said that Dungness is a tourist destination without tourist attractions, this statement has of course to be tempered with the fact that Prospect Cottage and its garden is undoubtedly a draw for the middle aged and middle class Guardian readers of the world. This is certainly not meant as an insult, for it is what initially drew us to the place. As an ‘attraction’ it is strange in that it both draws one in and excludes in the same moment. As a garden, as a cottage, it is both monument to Jarman’s life and work and a continuing home to his partner at the time of his death. As such it feels an imposition to stop and linger for too long, yet I know that many do. Many even walk into and over the garden, assuming somehow that is is a public exhibit. It must be exhausting to live with that. Then again, that tension between privacy and exhibitionism is entirely appropriate for it is often at the core of any artist’s life and perhaps Jarman’s in particular. There is a lovely opinion voiced in the 'Life As Art’ documentary about Jarman’s vision of England being essentially conservative with a small ‘c’; about how it was of an England of "beautiful, unspoiled countryside” and “good, clean, nice people” (which chimes with my thoughts of Ray Davies and his visions of a mediated, mythic England). And this view of course clashes magnificently with the outward appearance of his work. One wonders if the one is possible without the other. Certainly Prospect Cottage and it’s garden would not be possible without Dungness. Yet although the appeal of Dungeness would certainly remain intact without Prospect Cottage, there is a delicious symbiotic relationship between the two that certainly means that in this moment in time it is difficult to imagine Dungeness without it. So The Orchids are the group who have drawn the short straw, and it is the title track to their ‘Striving For The Lazy Perfection’ set that illuminates the way. And what a brilliant illumination it is: James Hackett’s wispery thin, blissfully mumbled vocals drift gently atop a confident, supple yet never strident groove; Pauline Hynds’ similarly soulful but stronger singing provides a scintillating counterpoint; the sound of strings and percussion tickle through the mesmerising sequencer blips like sprinkles of rain on the roof. Again, as in so many of the songs I find myself drawn to in this series, it is the space in the production that allows all of this to work. Gaps are left for those refrains to drip and drop into and out of. The choreography of sound is elegant in a pragmatically elementary manner: It might be grubby wee boys dancing in tenement bedrooms, but it’s richer and more beautiful for all that.